Ukraine International Airlines (UIA) is planning to expand into the long-haul market in 2013 with widebody aircraft being added for flights to North and Southeast Asia. The eastbound expansion marks a significant milestone for UIA as it will help balance out a western-focused network and help the carrier continue to build its transit hub at the Ukrainian capital Kiev. Asian expansion will also result in more intense competition with Ukraine’s other major carrier, AeroSvit, which already operates widebodies and is planning later this year to double the size of its for now small network in North, South and Southeast Asia. UIA CEO Yuri Miroshnikov told CAPA on the sidelines of last week’s IATA AGM in Beijing that the privately-owned carrier aims to launch services to Bangkok and Beijing in 2013. UIA is now seeking to lease at least two widebody aircraft to support the new flights, most likely Boeing 777s although A330s are also being considered. 767s, which AeroSvit currently operates to Bangkok and Beijing along with other medium/long-haul destinations, is not under consideration according to Mr Miroshnikov due to their relatively higher seat costs. Mr Miroshnikov says a third widebody aircraft could be acquired as part of a second phase in 2014 and used to launch a third Asian destination. Hong Kong and Kuala Lumpur are under review, neither of which is currently served from Kiev by any carrier. UIA now operates an all-narrowbody fleet consisting of 20 737s, including four next-generation 737-800s and 16 737-300/400/500 Classics. 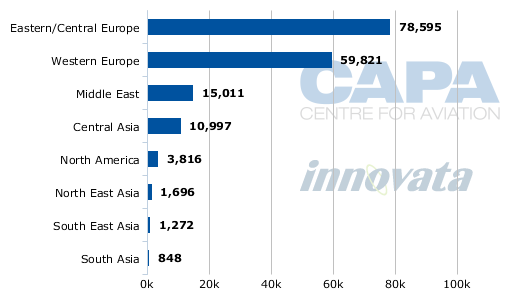 The carrier’s network is heavily focussed on Europe, which according to Innovata data now accounts for about 85% of its international capacity. The remaining 15% of UIA’s international capacity is flown east and south to Central Asia and the Middle East. 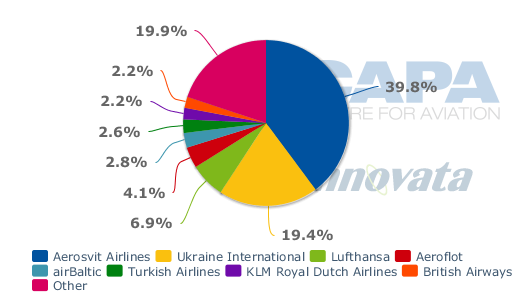 About 28% of the carrier’s total capacity is currently allocated to Ukraine’s domestic market, according to Innovata data. Eight of UIA’s 10 largest destinations are in Europe. The only exceptions are Tel Aviv in Israel and Tbilisi in Georgia. The carrier’s furthest destination to the east is currently Almaty in Kazakhstan, which is a little over five hours from Kiev. Dubai is also about a five hour flight while Lisbon is UIA’s westernmost destination and is about four hours from Kiev. While AeroSvit has a wider network – with medium/long-haul flights to Southeast Asia, South Asia, North Asia and North America – it also is highly dependent on European routes. About 74% of AeoSvit’s capacity (based on seats) is allocated to European routes. But AeroSvit’s European network is more focussed on Eastern and Central Europe, which accounts for about 62% of its total international capacity compared to only about 12% for Western Europe while UIA’s international network is more focused on Western Europe, which accounts for 69% of its international capacity compared to only 16% for Eastern and Central Europe. While Ukraine’s two major carriers compete on several international routes, they also cooperate in certain markets with a codeshare arrangement. It is unclear if this partnership will be maintained given that both airlines will soon be fully in the private sector and because of UIA’s expansion into long-haul markets, a traditional territory of AeroSvit. The Ukrainian Government no longer has a stake in UIA and is now reportedly seeking to sell its remaining stake in AeroSvit. UIA’s expansion could also see it start to close the gap with its larger rival. 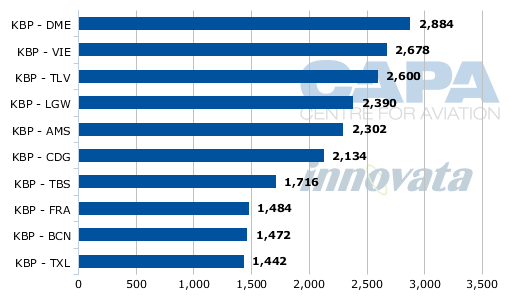 AeroSvit currently has nearly 60% more international capacity (seats) and 30% more domestic capacity than UIA, according to Innovata data. In recent years UIA has been working at building up its transit business, focussing on domestic-to-international as well as international-to-international connections. Mr Miroshnikov says about 30% of UIA’s traffic is now transit, compared to only 10% a few years ago. The increased focus on transit traffic came as UIA tweaked its strategy, abandoning what Mr Miroshnikov refers to as a hybrid model that was geared towards point-to-point traffic and had some LCC components (although it continued to offer a full service product across two classes). 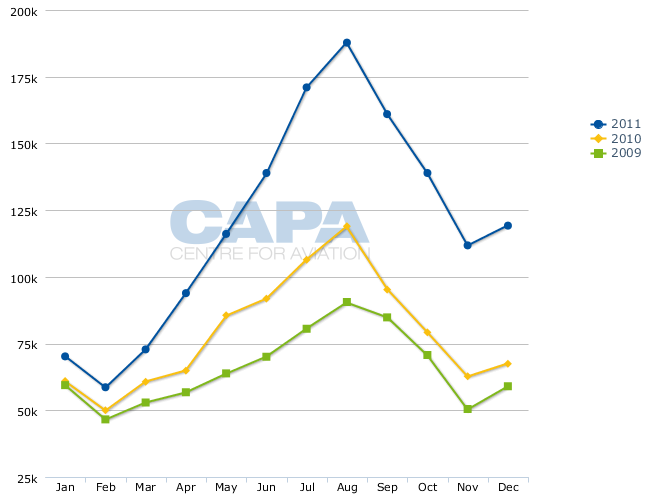 UIA is now following more a network model, which has resulted in lower average aircraft utilisation rates in order to maximise connections. The shift in strategy also involved cutting almost all of its charter operation, which a few years ago accounted for about 30% of UIA’s passenger traffic. Meanwhile the carrier has stuck with a full service product and has retained a convertible business class across its fleet. As UIA has built up its hub, east-west connections have become an increasing important component of its business. Both UIA and AeroSvit have focussed on offering connections between Europe and Central Asia, a relatively underserved but growing market. The two carriers have particularly developed a strong position in Kazakhstan, which in recent months has emerged as a controversial subject as Kazakhstan has expressed reluctance to renew UIA’s traffic rights in what is generally seen as a move to protect Kazakhstani flag carrier Air Astana. UIA and AeroSvit now provided about 8000 weekly seats between Ukraine and Kazakhstan with UIA serving two destinations in Kazakhstan and AeroSvit five. Kazakhstan is now the sixth largest international market from Kiev following Russia, Germany, Israel, the UK and another Central Asian country: Georgia. For Kazakhstan, Kiev is the third biggest destination based on current capacity after Moscow and Istanbul, with a large portion of the passengers carried between the two countries likely travelling beyond Kiev to points in Europe and Israel. UIA has secured a temporary extension of traffic rights to Kazakhstan after a recent battle in which it had to warn passengers of a possible cancellation of flights. But the carrier will likely not be awarded a permanent extension and could be forced to reduce capacity or withdraw completely from Kazakhstan, leaving AeroSvit as the only Ukrainian carrier with traffic rights to Kazakhstan while paving the way for the launch of flights to Kiev by Air Astana. Until now Air Astana has steered away from launching service to the Ukraine, although Kiev is an important white spot in its growing regional network in the Central Asia/CIS regions, because it viewed the Kazakhstan-Ukraine market as oversupplied with fares irrationally low. As they will provide new feed to its European flights, UIA’s forthcoming Asian flights will help offset the likely loss of some or all of its flights to Kazakhstan. The upcoming expansion to Asia will help further improve the balance in UIA’s network and bolster its east-west connections. Asia and widebodies has been studied by UIA for several years. But the carrier feels now is the time to finally make the plunge and is enticed by the growth opportunities in Asia. Adding widebody aircraft would also give UIA the potential opportunity to launch flights to the US but Mr Miroshnikov says “Asia would be the first priority”. The Ukraine currently has a Category 2 safety rating from the US FAA. Mr Miroshnikov says the Government is now working on improving the country’s infrastructure to meet Category 1 standards. But until a Category 1 rating is achieved, no Ukrainian carriers can launch new routes to the US, codeshare with US carriers or increase capacity on existing US routes. AeroSvit currently serves one destination in the North America, New York JFK, with one daily frequency using 767-300ERs. It is the only carrier in the US-Ukraine market after Delta suspended its New York-Kiev route in Jun-2011. The Ukraine-North American market is less a priority for UIA as it is predominately a one-stop market that can be effectively served with interline partnerships via Europe. In the Ukraine-Asia market there are fewer options for working with other carriers and growing point-to-point demand. The larger Asia-Central Asia/East Europe market is also under-served, and China Southern is developing a hub in Urumqi, in China's west, to help grow traffic. Bangkok is particularly a strong outbound leisure market in the Ukraine. 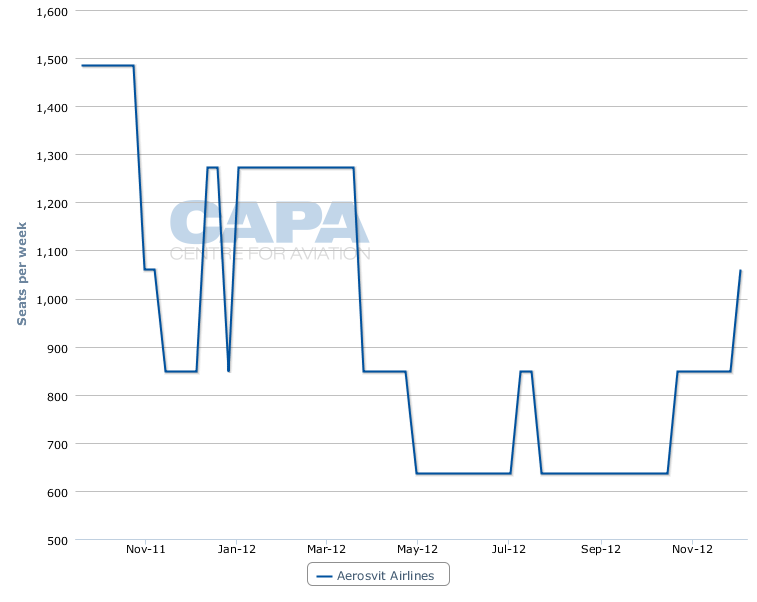 By using higher capacity aircraft than AeroSvit, which currently operates three weekly flights to Bangkok using 767-300ERs but offers additional frequencies in the peak season (see Background information), UIA could potentially undercut its competitor and quickly gain a large share of this price sensitive market. It could also open up one-stop connections from Bangkok to European destinations, focusing on those destinations that do not have non-stop services to Bangkok. AeroSvit is also the only carrier currently operating on the Kiev-Beijing route, offering four weekly 767-300ER flights. With Beijing UIA could tap into growing business ties between the Ukraine and China as well as leisure demand, including growing demand for Chinese tourists heading to Europe for holidays. While there are about 35 foreign carriers now serving Kiev, there are currently no carriers from east, north or south Asia serving the Ukrainian capital. This gives the Ukrainian carriers an opportunity to expand in Asia as the Ukraine-Asia market grows. While UIA is planning to enter this increasingly important market, AeroSvit has already unveiled plans to double its Asian network with new 767-300ER flights to Shanghai, Ho Chi Minh City and Colombo. AeroSvit plans to launch all three routes in late Oct-2012, giving it two destinations in North Asia (Beijing and Shanghai), two in Southeast Asia (Bangkok and Ho Chi Minh City) and two in South Asia (Delhi and Colombo). Shanghai and Colombo will initially be served thrice weekly while Ho Chi Minh will be served with two weekly flights. 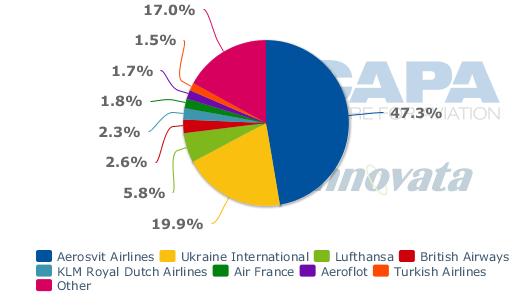 Ukrainian carriers currently account for just under 60% of total international capacity at Kiev, including about 40% for AeroSvit and about 19% for smaller UIA. In terms of ASKs, Aerosvit has an even larger market share, about 47% of total capacity, as it is the only long-haul operator at the airport. The seven largest international carriers at Kiev are all from Europe (led by Luthansa and Aeroflot), which shows the importance of more Asian flights as it enables the Borispol International Airport to offer a more balanced network. 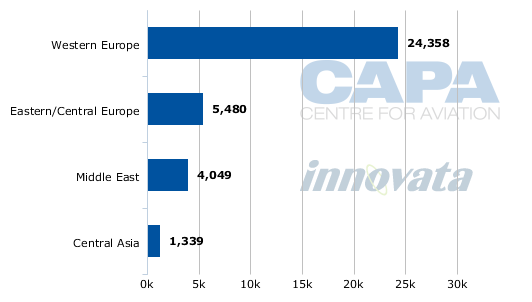 Europe accounts for an overwhelming 80% of total capacity (based on seats) at Kiev, according to Innovata data. In addition to Kiev lacking any carriers from Asia, the airport is not served by any of the big three Gulf carriers. Instead only low frequency narrowbody service is provided by Middle Eastern LCCs Air Arabia and FlyDubai as well as Royal Jordanian. Ukraine-Israel, however, is a big market with El Al, AeroSvit and UIA all operating multiple daily flights. In addition to Bangkok, Beijing and New York, AeroSvit also now uses its 767-300ERs to serve Delhi (with 767 services to Colombo, Ho Chi Minh and Shanghai to be launched in late Oct-2012). Mr Miroshnikov says UIA has looked at Delhi using its existing 737s but for now decided against pursuing service to South Asia. Kiev-Delhi with 737s would require payload restrictions while the widebody aircraft UIA is looking to acquire are probably too large for Indian routes. UIA is an opportunistic acquirer of aircraft and has not placed any orders with manufacturers since the 1990s. The carrier decided to begin renewing its 737 Classic fleet with leased 737-800s back in early 2008, when it agreed to lease four 737-800s for delivery in 2009 and 2010. But over the last couple of years it decided to put the 737 Classic replacement programme on hold and as a result has not yet committed to additional 737-800s. As lease rates for 737NGs are now on the decline, UIA is looking at resuming the narrowbody fleet renewal programme. 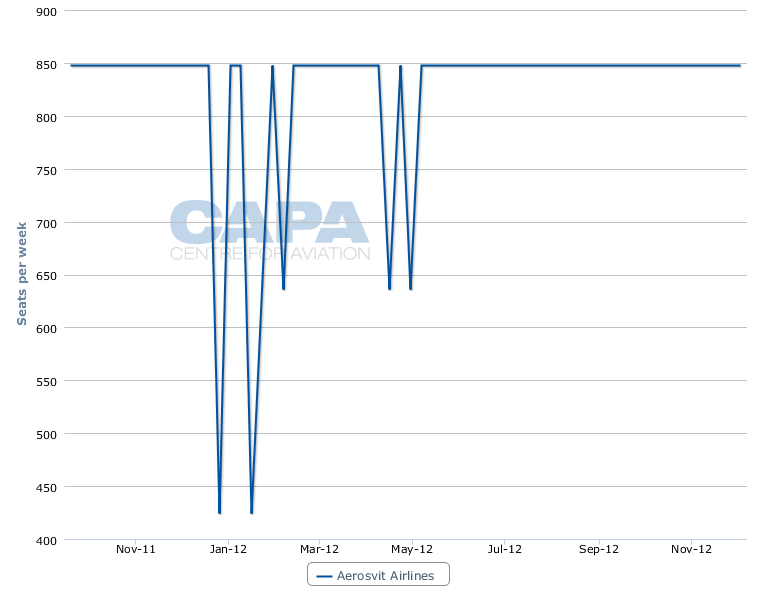 Just as it is scouring the leasing market for 777s or A330s, the carrier is now actively searching for 737-800s. Mr Miroshnikov says the carrier’s preference is to find packages of aircraft rather than do deals one at a time as it aims to replace its 16 737-300s/400s/500s over the next three to four years. The next few years could see major changes for Ukraine International. A renewed narrowbody fleet and the addition of a widebody fleet will significantly improve UIA’s product offering and give it new network options. It will result in increased competition between Ukraine’s two major carriers and could improve the potential attractiveness of UIA to global alliances, which so far have only expressed limited interest in potential Ukrainian members.